A tricky, balance and beat performance from our Unicyclist extraordinaire! A tricky, balance and beat performance from our Unicyclist extraordinaire! Age 9-99 years. 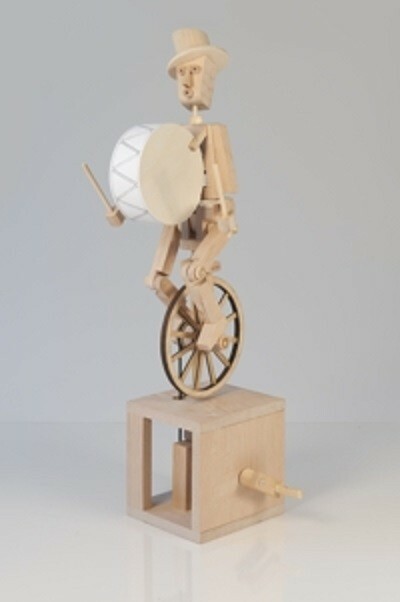 Making a Timberkit is to step into the whole world of Automata, ingenious moving models and scenes. It is an art form in which you can appreciate the magic of mechanical action and a fascinating education and hobby for children and adults of all ages. Amaze your friends! No special knowledge or skills needed, just a little time and patience to follow the instructions.In these safety conscious electronic times most of the mechanisms we depend on are well hidden so we never get to see how things work. Take a look at the building blocks of our mechanical world. Assemble the wooden cams, push rods, levers and cranks and understand what makes it tick.After you have made the model you can paint, varnish or customise it in your own personal way then try another!